Yesterday on Mother’s Day, I gave you a sneak peek at our Mother/Daughter style post that would be going live today, plus a little behind the scenes look at our photoshoot craziness. I hope you all had an amazing Mother’s Day weekend. I was spoiled rotten and it was a weekend full of surprises and fun. Today’s Style feature is dedicated to two topics: 3 Ways to Style a Maxi Dress (Mother Edition)+ 3 Ways to Style a Romper (Teen Edition). I hope you enjoy it and get some fun outfit ideas for yourself and for your teen. This is one of my favorite ways Hannah styles her romper. It’s perfect for those cool spring days and even those summer days that aren’t too hot. The sweater is extremely lightweight and if she is out and about and gets too hot, she can always take it off. Something as simple as adding a thin belt to your romper can add a new look to it. This thin brown belt Hannah added matches her sandals and ties the look together. I love this look on her and think it’s a great way to style this romper. It still shows off the really cute ruffle on the romper, but she can also now wear it to school. 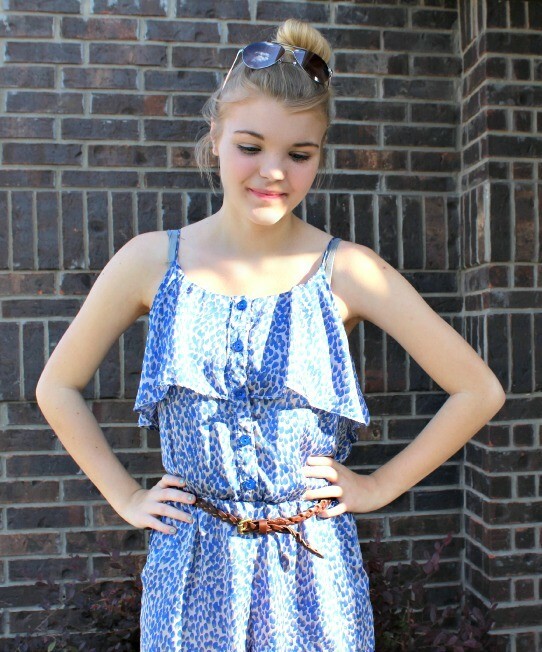 Rompers are so popular right now and not just for teens! I love mine too and am thinking about picking up another one for the summer. Here are a few more cute outfit ideas with rompers. Buying this Elle Denim Jacket was one of my best purchases this spring. I wear it A LOT. Even if it’s hot outside, I bring it with me if I’m going to be inside somewhere that I know typically keep their air conditioning at below zero degrees. That denim jacket keeps me happy. I’m also so pleased with this Peter Som for Kohl’s Striped Maxi Dress. The colors and fit are phenomenal. I think the denim jacket really brings the colors out. I have a couple of maxi dresses that have no dimension to the waist and there’s nothing wrong with that, but sometimes I want to see that I have a waist. So, I’ll belt my maxi dress. 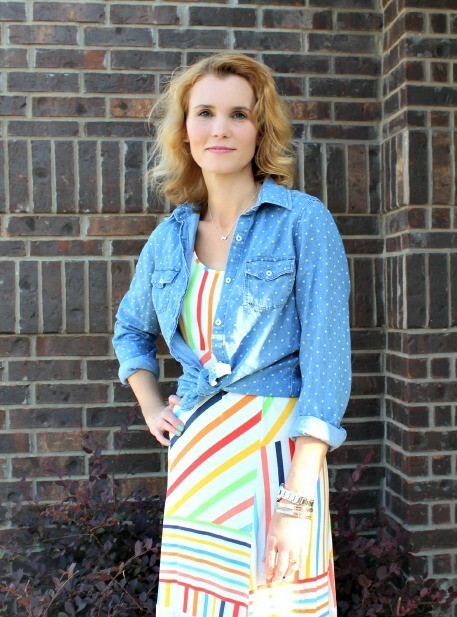 This maxi dress is very fitting but I decided to try a belt to see what it would look like and I love it! It gives it a whole new look. 3. Throw on a Button Up Shirt and Tie It! 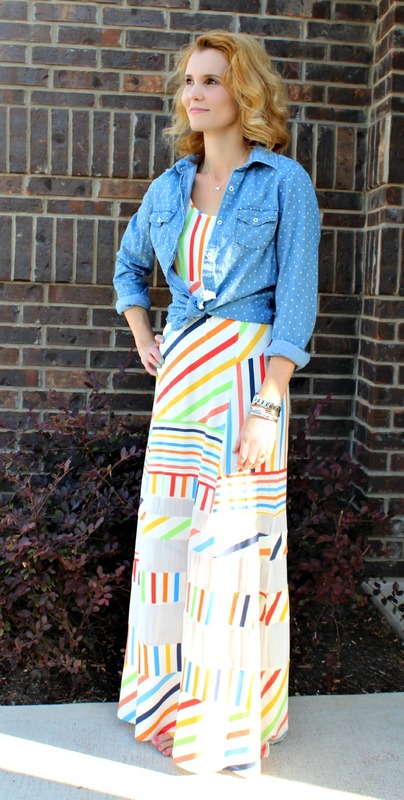 I think this might be one of my new favorite ways to wear this maxi dress. I absolutely love it. It’s comfortable, casual and I decided to go barefoot because I pictured myself walking along the beach in this exact outfit. I like the mixing of patterns and a chambray shirt is always a good idea. Which maxi dress outfit is your favorite? Let me know!! I hope you enjoyed today’s style post. Thank you for stopping by! I linked up with Momma In Flip Flops for #RealMomStyle who is also wearing a gorgeous maxi dress. Be sure to visit for some super fabulous style posts from other mommas. Oh my goodness,you have no idea how much i love this post. I love a mother/daughter post, I love a romper and that maxi dress on your is absolutely breathtaking. I can’t even tell you which one I like the best. Great job ladies and you are both stunningly beautiful!! Happy Mother’s Day. Thank you so much Andrea!! 🙂 We had a lot of fun with this one. Happy Mother’s Day to you too.